We specialize in Residential Real Estate Investments. 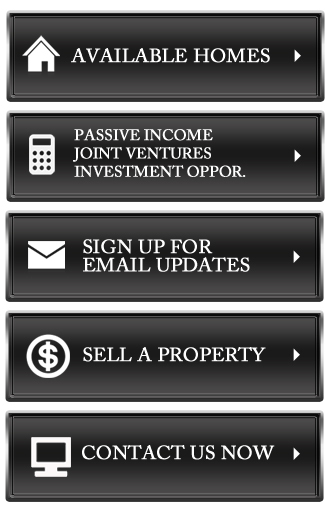 We create win/win opportunities for passive investors, active investors and home buyers. We are real estate investors ourselves so we know what it takes to make it work. We are always diligently and consistently scouring the market place, deploying strategies & forming alliances only experience can provide. This allows us the ability to find the right properties, know they're the right properties, then buy at the right prices. We are able to then pass these homes on at below market prices to our buyers & investors. There are a variety of ways we can help, all depending on the investors particular needs. From quick turn real estate to buy and hold. If you’re looking to buy or invest in residential real estate, we can help. Thank you for your time and interest visiting this site. Please look around and let us know how we can help you with your real estate investing needs. Investors use your funds and our Experience to build wealth as part of your savings or investment plan. Options include using IRA’s and Roth’s or replacing low performing stock’s, CD’s, 401K's, trust's, or future funds in place for children, grandchildren, etc.